I started a 365 on film this year, but I am not sure daily shooting, especially with film, suits my personality, so I guess it will be more of a monthly post. Please don't expect perfection, as this is a personal project that I am doing for fun to help me document my everyday- the things I love or find pretty. It's time for our monthly favorite on Who We Become. My February favorite is from December, after the wedding, when we went to Marco Island for two days to really relax and rewind. It was perfect! The sky looked like cotton candy on our last night. I cannot post this without posting this lovely sunrise as well. I had not been to Marco in many years and must say I fell in love. Please continue on to see my friend and fellow photographer Sarah Davis' favorite. You may see all of our work in a mosaic at the blog Who We Become. Our first family wedding! Our oldest daughter, Kelly, married her high school sweetheart just before Christmas! It was such a wonderful day filled with so much love and joy. I let the photographer's do their job, but had to grab my film camera when they started their first dance. Loaded with Ilford 3200, a big grainy film, I knew it was my only chance to capture the moment, in the dim light, under the twinkling tree lights. I held my breath, literally, and prayed they would turn out. I will remember this moment forever, as I am sure they will too. Canon 1v, 70-200 2.8 II, Ilford 3200 Photovision. Please continue along and see the beautiful work of my friend and fellow photographer, Jill Cassara by clicking HERE. Her work always amazes me. You may also view all of our work in a mosaic at Who We Become. Who We Become is featuring our favorite image of the month and mine was definitely this engagement! 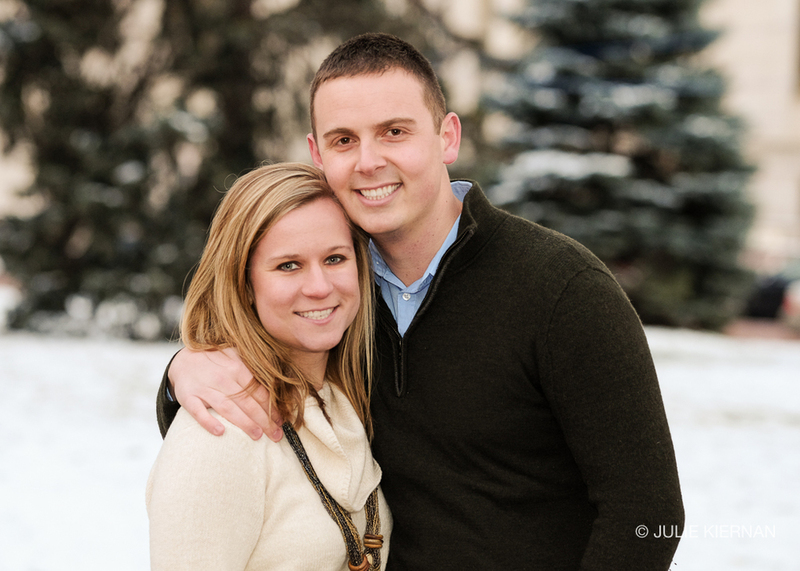 Love was in the air again on the Friday after Thanksgiving when Tyler set it up to look like a normal family session.....until he proposed to Annie under the lights in Rice Park. It was so special! And so wonderful to have both families there to witness the engagement and hear Annie's excited "Oh my gosh, Oh my gosh" followed by lots of laughter and joy. Tyler described it as the happiest day of his life, so far. There was lots of hugging and gushing over the gorgeous ring. Annie couldn't stop looking at it. Then they all celebrated at the St. Paul Hotel and later with dinner in Minneapolis. This is going to be one fun wedding! Please continue along our blog circle to see the beautiful work of my friend and fellow photographer, Kim DuPree. You can also see all of our favorite images this month on Who We Become. Click to see more of my wedding and engagement work or please contact me for more information.